From a staggering amount of Bitcoin on the move to the use of XRP as a base pair, here’s a look at some of the stories breaking in the world of crypto. Some of the richest Bitcoin wallet addresses are suddenly moving massive amounts of crypto. In a 24-hour period, the ninth, tenth and eleventh biggest Bitcoin wallets suddenly cranked into motion, moving an eye-popping total of 232,024 BTC, worth about $891 million at time of publishing. Although the owners of the wallet addresses are unknown, there’s speculation that some of the movements could be due to a major crypto exchange shifting assets around in an effort to keep them secure. The founder of the Ethereum-based development studio ConsenSys says the company is implementing a big shift in strategy to adjust to the crypto bear market. As reported by Breaker, Joseph Lubin says he’s restructuring the company to ensure it invests wisely and stays lean. Ripple discussed the future of crypto and blockchain in a new interview with Kevin Werbach. Werbach is a professor of legal studies and business ethics at the Wharton School of the University of Pennsylvania. Wharton is participating in Ripple’s University Blockchain Research Initiative (UBRI). You can check out the full interview here. Meanwhile, the Vancouver-based crypto exchange CoinField says it’s expanding its use of XRP as a base pair. The company plans to announce a number of new pairs in the near future. In a new blog post, the chief technology officer of EOS, Block.one developer Dan Larimer, reaffirms his commitment to the platform. An Ethereum Classic development team (ETCDEV) is closing its doors after running out of funds. The prolonged bear market has also forced blogging platform Steemit to lay off 70% of its team. Steemit, one of the leading blockchain-based social networking sites, uses Steem tokens to reward content creators. Two years ago the platform grew 1,600% in just two months, paying out $1.3 million to its users. Now the social network has turned down the volume. After posting several tweets per day in November, the Steem team made its most recent tweet two weeks ago, on November 20. The US Department of Homeland Security is reaching out to small businesses that could help the agency find ways to track transactions on privacy coins like Monero and Zcash. The proposal surfaced on FedBizOpps. Emurgo director Gareth Hayes is offering some insight on the company’s efforts in a new interview with Blockchain Media. The Hong Kong-based company is a startup accelerator working to create DApps on the Cardano protocol. 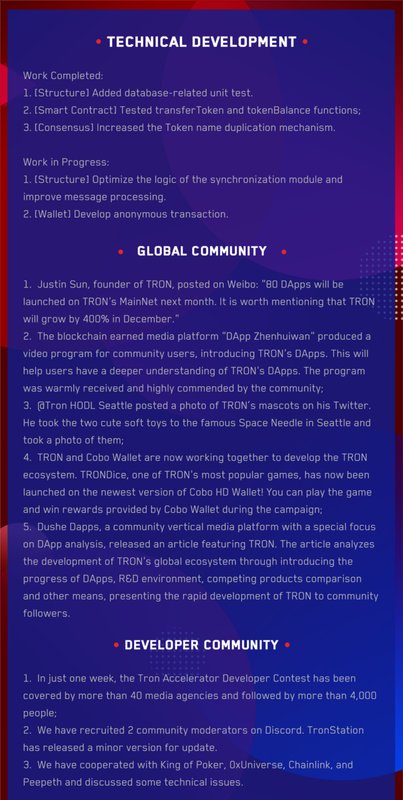 Tron just released its weekly update, covering the latest technical advancements, community efforts and decentralized app developments on the network.